Further details and booking information from www.artsandhealth.ie / 051 842664. The fee for the full day, including lunch, is €30. Themed Promoting Autonomy, this leading national arts and health event will feature a keynote address by hospice director, arts advocate, music therapist and author Nigel Hartley, and presentations by some of the most innovative and creative practitioners working in arts and health in Ireland today. Check Up Check In 2019 takes place on Thursday 11 April at Garter Lane Arts Centre, Waterford and is open to healthcare professionals, arts practitioners and anyone interested in learning more about this exciting field. Check Up Check In 2019 is organised by www.artsandhealth.ie/ Waterford Healing Arts Trust (WHAT) and Create, the national development agency for collaborative arts, with local partners Garter Lane Arts Centre and Waterford City and County Council Arts Office, and is funded by the Arts Council and the HSE. Further details and booking information from www.artsandhealth.ie / 051 842664. The fee for the full day, including lunch, is €30. Waterford City and County Council is the administrative local government body for Waterford City and County. The Waterford City and County Council Arts Office arts programme is a development based programme which aims to nurture, grow and pursue excellence in the arts, in addition to encouraging and building arts audiences. Following the tremendous success of Check Up Check in 2018 and marking the opening in 2019 of the new South East Palliative Care Centre at University Hospital Waterford (UHW), the theme of this year’s event is Promoting Autonomy,with presentations highlighting the potential for arts programmes in healthcare settings to explore ways for individuals to engage, discover and create, even when faced with a challenging health condition. 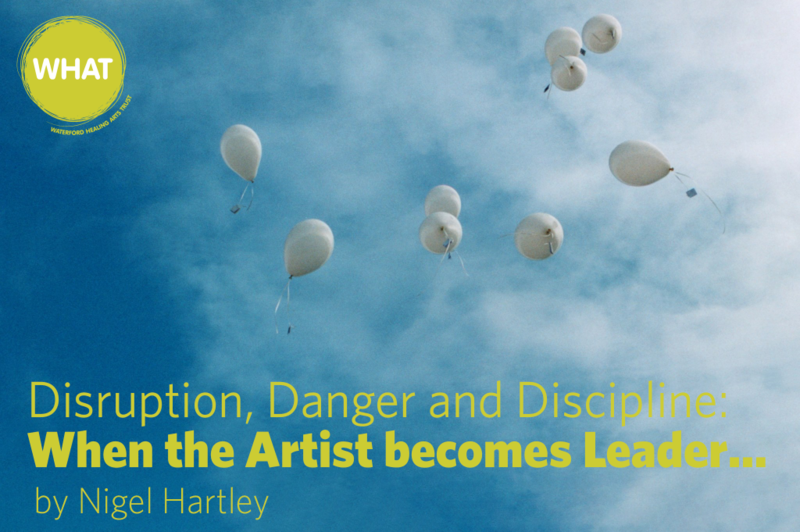 In his keynote address, Disruption, Danger and Discipline: When the Artist becomes Leader…, Nigel Hartley will reflect on the role of the artist in end of life care and the artist as leader. He will further share his vast experience and offer practical advice for negotiating the challenges of working in this important and rewarding area in a workshop setting later in the day. – Sticking Points: What to do when you get stuck – Artists and healthcare professionals share challenges they have faced in their work and look for solutions to overcome them. – Arts and Dementia : Case studies of Training Notes, Waterford Council’s training programme for musicians in healthcare settings, and Open Gallery, Waterford Healing Arts Trust’s art project on the hospital ward, both of which have a particular focus on people living with dementia. – Hospital Voices : A conversation with composer Eric Sweeney and poet Edward Denniston, reflecting on their experience as WHAT/UHW Artists in Residence 2018 and the creation of a choral work, in collaboration with patients and staff, to mark the 25th Anniversary of Waterford Healing Arts Trust. Announcing details of Arts and Health : Check Up Check In 2019, Claire Meaney, Acting Arts Director of Waterford Healing Arts Trust, which manages artsandhealth.ie said “We are thrilled to bring Check Up Check In to Waterford for the first time. Having hosted the event in Dublin, Sligo and Cork previously, we chose Waterford this year for two reasons: Firstly as part of our year-long celebration of the 25th Anniversary of Waterford Healing Arts Trust and, secondly, to mark the extraordinary development of the new South East Palliative Care Centre, which will open at University Hospital Waterford later this year. This is the first hospice for the south east and is a groundbreaking initiative which will greatly improve the quality of life for people living with a life-limiting illness here in the south east region. To mark this important moment, we are very excited to welcome Nigel Hartley, who has a wealth of experience in arts provision in end of life care, as our keynote speaker for Check Up Check In 2019. We believe that Nigel’s address, and our many other presentations on the day, will inspire artists and healthcare professionals to identify ways to engage creatively with people, whatever their health situation. Along with our partners Create, we’re also really pleased to welcome artist Marie Brett, whose workshop the following day will expand on these discussions by exploring how the artist working in a challenging setting can reflect on their practice, nourish the self and maintain supportive networks, in order to sustain themselves and their practice”.